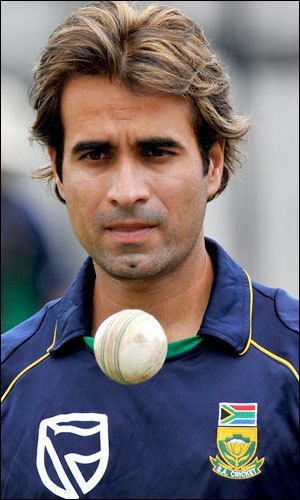 Mohammad Imran Tahir (Urdu: محمد عمران طاہر‎; born 27 March 1979) is a Pakistani-born cricketer who plays for South Africa. A spin bowler who predominantly bowls googlies and a right-handed batsman, Tahir currently plays for the Proteas and the Lions in South Africa and Derbyshire in English county cricket. He also represents Rising Pune Supergiants in the Indian Premier League. On 15 June 2016, Tahir became the first South African bowler to take seven wickets in an ODI, and also the fastest South African to reach 100 ODI wickets (58 matches). On 17 February 2017, Tahir became the fastest South African to reach 50 T20I wickets.On 4 March 2017, against New Zealand he recorded the most economical figures by a South African spinner in an ODI, with 2 wickets for 14 runs from 10 overs. Imran Tahir was born in Lahore, Pakistan, and learnt the game while growing up there. Being the eldest sibling, he started working at the age of 16 as a retail salesman at Lahore's Pace Shopping Mall on a meager salary, to support his family. His fortunes changed when he was selected during trials to represent the Pakistan U-19 cricket team, eventually progressing onto the Pakistan A side on some tours. However, he failed to make the transition to the next stage. Pakistan were blessed with some quality spinners and Tahir could not make his mark at the senior level to warrant a selection. He began playing county cricket in England but did not stay there for long. He then moved to South Africa, which faced a perennial dearth of quality spinners. In South Africa, he played domestic cricket for five years and lived "hand-to-mouth for the first two years." There, he also met his wife, a South African citizen of Indian origin, and settled down in the country. As well as his first-class career in Pakistan, Tahir has had short spells with Yorkshire and Middlesex in county cricket as well as playing for Staffordshire in the Minor Counties Cricket Championship. While Tahir has represented Pakistan Under-19 cricket team's and Pakistan A, he failed to win full international honours for Pakistan. 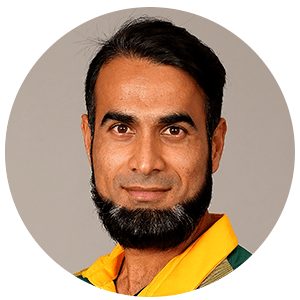 Tahir is married to Sumayya Dildar, a South African woman, and has represented South Africa after becoming eligible to play for them when he met his four-year residence requirement in April 2009. Tahir was a member of Hampshire's 2009 Friends Provident Trophy winning squad, taking 2/50 from 10 overs in the final against Sussex. Tahir made his career high score of 77 not out in a County Championship match against Somerset on 28 August 2009. For the 2010 season Hampshire signed Sri Lankan spinner Ajantha Mendis, replacing Tahir for the season. Tahir represented Warwickshire for the 2010 season, although he is contracted to play for Hampshire from the 2011 season onwards. Tahir made his 100th first-class appearance in the 2009/2010 SuperSport Series when the Titans played the Lions. On 8 January Tahir was called up to the South Africa squad in their Test series against England although he was then withdrawn one day later after Cricket South Africa revealed that he was not eligible to play. At the end of the 2009/10 season, Tahir moved from the Titans to the Dolphins. This was due to a lack of first-class cricket with the club, who preferred to play 23-year-old leg-spinner Shaun von Berg. When Tahir was called into South Africa's squad for the final Test against England, national coach Mickey Arthur said "I'm not entirely sure what the issues are between him and the Titans, but the Titans obviously aren't going to pick him because they'd rather pick the young leggie they have". He holds the record for representing highest number of teams (27) in the world. He moved to the Highveld Lions in 2012. He got his first call to the South African Test team in 2010 when England were touring, but it was due to an embarrassing error by the selection committee. 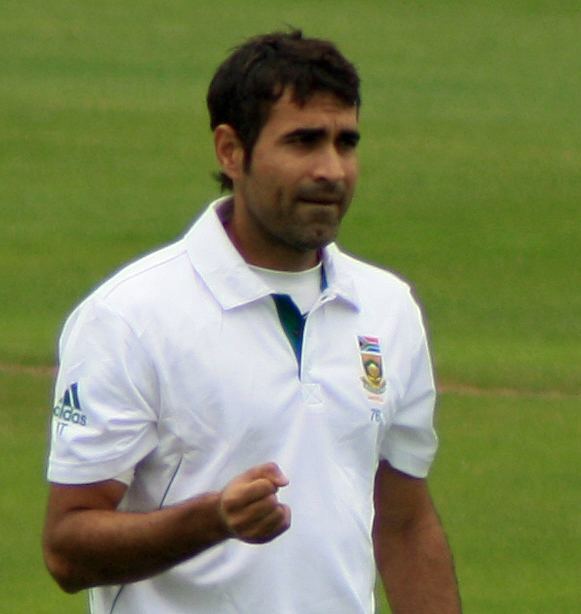 Tahir was not eligible to play for South Africa until January 2011. He was quickly withdrawn from the team then, but found his way back almost immediately after becoming eligible to play. He was selected for the ODI series against India, but was never picked in the playing eleven. Skipper, Graeme Smith, preferred to keep him as a surprise weapon for the World Cup in the subcontinent soon after. He impressed immediately, picking 14 wickets in the five games he played. He remains as an attacking option. He made his Test debut against Australia at Cape Town in November 2011 and since then, he has been a regular part of the squad. In the Test series against Pakistan in UAE in 2013, he was not picked for the first Test, but he came back strongly in the second by bagging a five-wicket haul on the first day of the Test match. Tahir was left out once again after one bad Test with the ball against India and was replaced by Robin Peterson, but he continued to do well in the shorter forms of the game. He was also the highest wicket-taker in the 2014 ICC World Twenty20, with 12 wickets at an average of 10.91. He continued to be a regular member of the South African side in all formats and played Test matches in spin-friendly conditions. Tahir qualified for South Africa on 1 January 2011, and was selected by them for the 2011 Cricket World Cup. Although he was part of South Africa's squad to play a five-match ODI series against India before the World Cup, Tahir did not make his debut. Captain Graeme Smith explained that this was because "[Tahir] is someone we want to keep fresh and we didn't want to give people the opportunity to see too much of him." Imran Tahir debuted for South Africa in a match against the West Indies on 24 February 2011 at the Feroz Shah Kotla stadium in Delhi. He took 4 wickets for 41 runs in 10 overs during his debut match. In November 2012 Tahir bowled 37 overs in a Test match against Australia, with no wickets for 260 runs – the worst bowling figures in Test match history. After the test, he was dropped and replaced by Robin Peterson. In October 2013, Tahir made a comeback to test cricket when he took 5 wickets in an innings for the first time in a test match and guided South Africa to clinch victory against Pakistan by an innings and 92 runs in the Dubai Test, thus levelled the series 1–1. He took 8 wickets in the match. At the 2014 ICC World Twenty20, Tahir bowled his best figures of 4–21 in South Africa's nail-bite match against the Netherlands on 27 March 2014, and was awarded Man of the match. Imran Tahir was South Africa's highest wicket taker in the tournament. Tahir also was joint highest wicket taker with Ahsan Malik from the Netherlands, both took 12 wickets in the tournament. 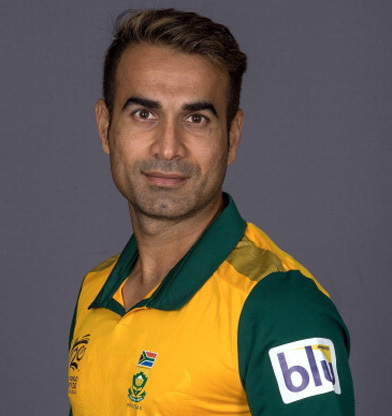 In the 2015 ICC Cricket World Cup Quarter Final match between South Africa and Sri Lanka, Tahir helped South Africa to their first ever World Cup knockout win with a Man of the Match performance of 4-26. In May 2017, he was named T20I Cricketer of the Year at Cricket South Africa's annual awards. 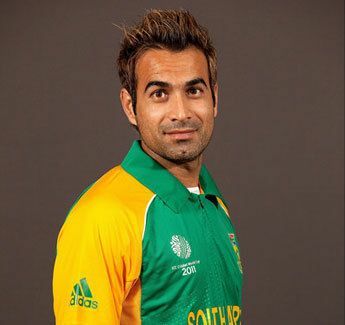 Tahir was South African international Twenty20 player of the year at the Cricket South Africa awards. Tahir was named in the ODI team of the year for 2015 by the ICC. In February 2017, he was ranked the No. 1 bowler in both ODI and T20 cricket. 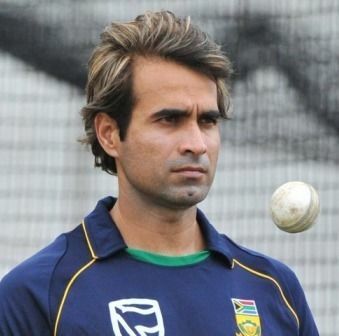 Imran Tahir has taken the most wickets by a leg spinner for South Africa in ODI cricket, passing Paul Adams. Paul Adams managed 29 wickets in 24 matches in his career and Tahir passed that record in 15 matches and currently took 70 wickets. Imran Tahir became the spinner with the most wickets in the ICC World Cup for South Africa he has 29 wickets. Tahir is the second spin bowler to take 5 wickets in an innings for South Africa and the only one to do so in the World Cup. His figures were 5/45 against the West Indies in the 2015 ICC World Cup. First South African bowler to take seven wickets in an ODI. Fastest South African bowler to take 100 ODI wickets (58 matches). Most Economical ten over spells by a spinner from South Africa - 10-0-14-2 with econ 1.40 by Tahir against New Zealand on 4 March 2017. Imran Tahir become first South African and fourth bowler to take 4 wickets in all three ICC events(WC, CT, T20WC). Imran Tahir has taken the most wickets by a leg spinner for South Africa, and currently sits on 21 wickets. Imran Tahir has the best bowling figures for any spinner in Twenty20 International cricket for South Africa. His 5/24 against the New Zealand. Imran Tahir was involved in the highest 10th wicket partnership for South Africa in T20 cricket. Tahir contributed 8 runs and Lonwabo Tsotsobe 1 run. The partnership was 10* unbeaten vs the Netherlands.